Before we worry about the differences between butterflies and moths, let's look at the things they have in common. Their body structure, like all insects, has three parts: the head, the thorax and the abdomen. The head has the eyes, a coiled mouth tube for sucking nectar or water, feelers (antennae), and some other sense receptors. 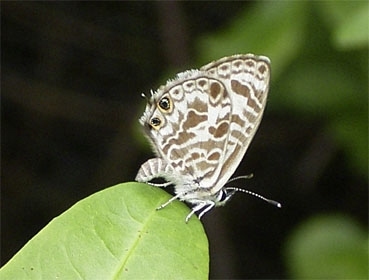 Antennae: Butterflies have clubbed antennae. 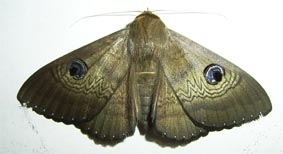 Moth antennae vary in shape, many have feathery antennae, such as the two below. Imperial Hairstreak Butterfly Feathery antennae of a moth - the apparently long antenna on the right is a shadow of the actual antenna Eyes and feathery antennae of a moth. The thorax (chest) has the wings and legs. Six legs for all insects, though some butterflies have greatly reduced fore-legs, and you might only count 4 if you don't look with a hand-lens. The abdomen looks after digestion, elimination and reproduction. Females have an egg-laying tube (ovipositor) at the end of their abdomen. A Common Crow laying an egg on the underside of a leaf A Zebra Blue about to lay an egg on a leaf edge. Butterflies and moths have four wings. The wings are made of clear hard tissue with many veins providing strength. The wings are coated with scales which easily rub off. The scales are very small, as fine as powder. 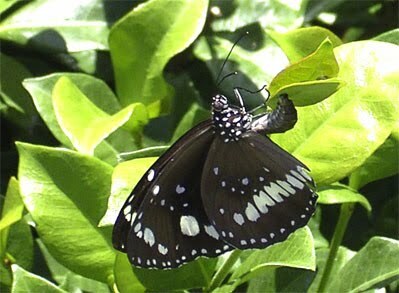 A Wanderer butterfly showing prominent black veins, of which 3 are pointed to by the green lines A day-flying moth, with the veins at the ends of the fore-wings marked out in white. 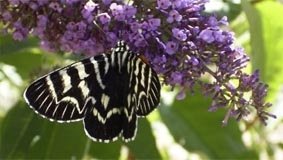 Female butterflies and moths lay eggs, maybe as many as 50 or 100. On average two only survive to adulthood (more, and there would be a plague). In some years more than 2 (on average) survive, and the species is abnormally abundant. Another year very few survive and the species may be hard to fnd. Mostly the eggs are laid on a plant that is suitable for the caterpillars that hatch to eat, and many species are very particular about just which plant they will eat. The Cairns Birdwing caterpillars only eat the native climber known as Dutchman's Pipe. Unfortunately the female butterfly can't distinguish the native plant from a popular introduced garden variety. But the caterpillars discover the difference - the foreign variety kills them. The caterpillars grow until their skin is too tight, whereupon they have a rest for a day until the skin splits, then they start off eating again in a bigger skin. This happens four or five times. Finally the caterpillar pupates - becomes a pupa, also called a chrysalis - an unmoving stage. Mostly butterfly caterpillars hide in a curled leaf to pupate, or hang camouflaged from a branch, or hide in the leaf litter under their plant. Some hang from a silk pad, some add a girdle like a rock-climber, others just lie loose. Most moth caterpillars spin a silken coccon, using the silk to attach themselves to a branch, or under bark, or in a dead leaf. No butterfly caterpillars spin a full silken cocoon, but a few have a loose webbing around themselves. If they pupate in autumn they might stay as a chrysalis all winter. 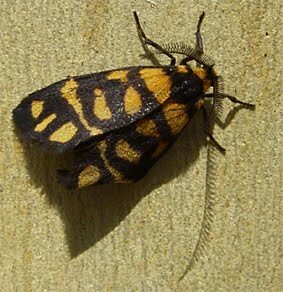 When the insect has developed inside the pupa, the hard shell cracks along the back, and a limp, wet butterfly or moth, with crumpled wings, crawls out. Then it rests, pumping fluid into the wing veins until they are stretched and the fluid hardens. Finally the insect is ready for flight and for breeding. Many rest with wings up, but some with them flat. Most spread their wings when warming up. Have "clubbed" antennae - small knobs at the ends of the two "feelers". Many have feathery antennae, some have antennae which come to a point, a few have clubbed antennae like butterflies - and many of these fly during the day! Their wings (on each side) beat together because they overlap. Many are brightly coloured, but this is not a certain aid to recognition, see, for example, the Eastern Flat below. 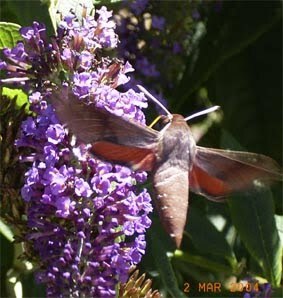 Most are drab or dull coloured, but there are many brilliantly coloured moths. A Tailed Emporer, a butterfly, resting with its wings 'up' A Yellow Migrant, a butterfly, feeding with wings 'up' An Eastern Flat, a butterfly that rests with its wings flat.